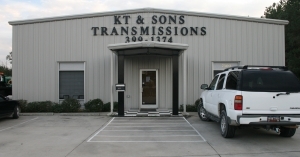 KT & Sons Transmissions and full service car repair offers a wide variety of auto repair services. Many are mentioned on the list of services below but if you do not see a service for your needs contact us for details. At KT & Sons Transmissions we offer towing service day or night with flatbed service to protect your vehicle. If your vehicle is broken down call us for fast pickup to protect your vehicle from vandals or theft.